Back when I was pregnant with my first son, family and friends and doctors warned me about everything from cradle cap to indigestion. As I pushed my newborns through the mall in a stroller, complete strangers would walk up and caution me about the terrible twos and the perilous teenage years. But not a single one of them warned me that one day I would hunker over these very children as they sat working on homework at the kitchen counter, and say mean things like your handwriting looks awful and stop tapping that pencil before I go out of my mind. They never once warned me that by 5:00 on school days I would develop a stress headache from math facts and spelling quizzes. I’ve tried several tactics: making them start on it as soon as they walk in the door (miserable), waiting an hour before calling them into the kitchen to get out their folders (Mo-om! Just ten more minutes! ), and delaying until after dinner (also miserable). I’ve tried working with one child at a time, which stretches the afternoon into one lo-ong session of letter-practicing, name-writing, and I forgot my book at school, leaving me almost no time to prepare dinner. Or check Facebook. And so this year we decided to go with the least painful solution: at 4:00 every afternoon, children in kindergarten and grades one, three, and four sit down at kitchen counter to work. The three year old provides comic relief by pretending he also can “wead books” and “wite my name”. The pencils are never sharp enough, there aren’t any blue crayons, and all of a sudden we need random, never-before-mentioned supplies like dice to roll and pennies to count. The three-year old gets “firsty” for drinks and “hungwy” for snacks. Patience is short and tempers flare. 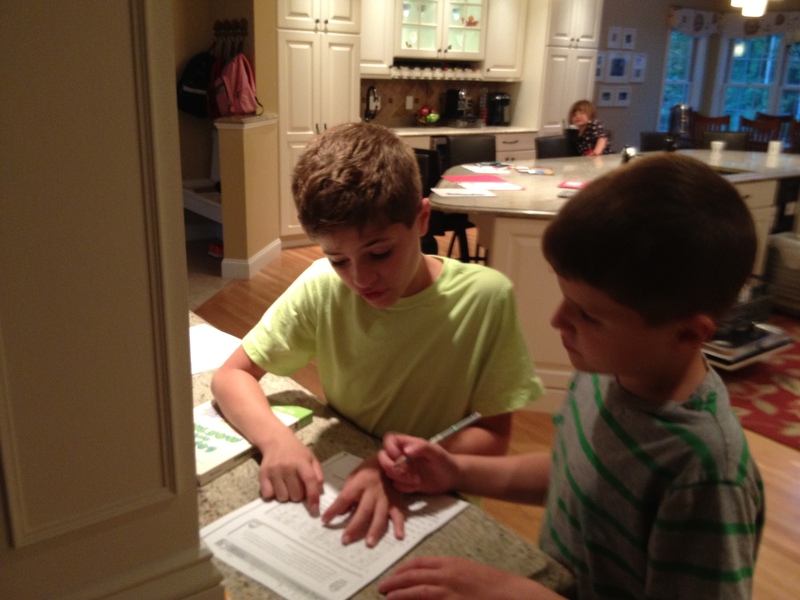 Jack, especially, has a hard time with homework. Tired and grouchy, the last thing he wants to do is review the subjects he’s worked on all day at school. He’s easily frustrated by repetitive exercises and says things like “I did this already! Today! In school!” before he slides off the stool into a crumpled heap on the floor. But then I looked down at Jack, and for the first time in nearly an hour, I really saw him. I saw a tired boy struggling to make sense of a busy, cluttered math paper, a boy who was desperately trying to understand his mother’s frustrated facial expression. I saw my literal son working to figure out why on earth he would need to round the price of lettuce from $2.99 to $3.00 when anyone could see it cost two dollars and ninety-nine cents. Glancing up from Jack’s tearstained face, I caught sight of my own reflection in the now-darkened windows, and I saw myself. I saw a woman who was tired of haggling over how long do I have to sit and I can’t do this anymore. A mother who was tired of listening to endless wheedling and whining about a seemingly simple worksheet. Tired of trying to explain the cost of groceries to a child who may never make an independent purchase with his own money. I was tired of his autism. So we took a break; we both needed it. I wandered upstairs to fold laundry and Jack bolted to the Wii. And as I folded pants and shirts and socks, I considered the skills he needs for homework. Certainly he needs to be able to add and spell and read and write. But he also needs to have skills like patience and confidence and resourcefulness. Things like flexibility and focus. With these abilities, Jack could conquer the academic requirements of math, reading, and history. And he could also stretch his mind to understand monetary transactions and the price of produce. It’s probably no coincidence that the very skills my autistic son needs to understand his assignments are the same ones I need to comprehend his autism. Homework is not just a time to recite vocabulary words and review flash cards; it’s a time for he and I to both grow, to stretch, to reach beyond our own limitations. With this idea in mind, I called Jack back down to the kitchen. And we began again. This time, I was determined to be a different mother. I so enjoy reading your about your life with your children. God has certainly blessed you with compassion and wisdom and patience, even though it gets stretched to the limit at times, your understanding and love shines through. Your reflections are so inspiring! They always remind me to look at my struggles from other perspectives, to persevere, and to be grateful (even for the hard things). God bless you and your family. You hit this out of the park, lady! I love the end thoughts about Jack needing the same skill set you (and I) to understand our lil’ dudes. LOL’ing about the difficulty with estimation only because I can’t tell you how often Sweetboy says to me “Why do I need to change the price? The price IS $4.99?”.